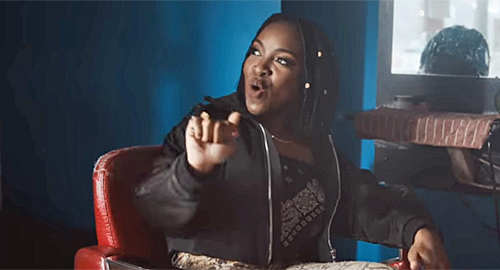 Ray BLK is a solid platinum star. The unexpected winner of the BBC's Sound of 2017 (everyone assumed it'd be Rag "'n'"' Bone Man) she's cut from the same cloth as Lauryn Hill - from her big-hearted soul melodies to the socially conscious raps. A day before she topped the BBC poll, Ray released a pointedly-titled new song: Patience (Freestyle). An ode to biding your time, it criticises the fame hungry "now generation", explaining she'd only bother us when she had something to say. "They're runni. Just to get in first place," she sings in that dusky voice, "I'm walking - going at my own pace." Appropriately enough, she's just uploaded the video - a mere nine weeks after the song was released. It's worth the wait, though. Sitting in a hair salon (the same one as her 50/50 video), Ray holds the camera's gaze, delivering the lyrics like she's having a conversation. It feels like you're hanging out with her - but you'll still be in awe of her presence and charisma. Like I said, solid platinum.